Technofrolic : Information Technology: What is "Netcut" and How it works? What is "Netcut" and How it works? This is a commonly used tool used on networks to cut down the network connection of victim. It makes a Denial of Service attack on the Victim so that he doesn’t get internet access. 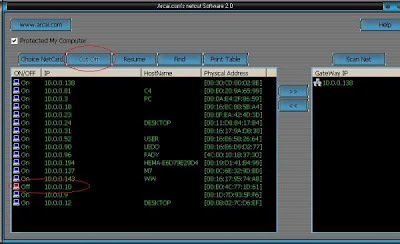 It does so by flooding the switch with unreal MAC address entries that point to the victim’s ip address, so the packets are mapped incorrectly and the victim receives no packets. 1.Netcut : To make Attack. 2.Ethereal : To Checks Packets. 3.AntiArp : To monitors and block all incoming and outgoing ARP traffic from / to my pc. 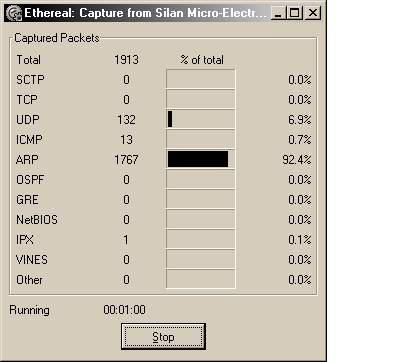 On the ethereal, it made 1767 ARP packets in only one minute..! The AntiArp shows that I ‘m sending fake Mac address to the gateway and I’m disguised as the victim’s IPaddress. (while if we make a man in the middle attack , we can get victims MAC address and set is as our MAC addr and give victim other addr ) . How to defend against a similar type of attack ?
. AntiArp is a nice tool the defends the MAC Denial of Service attack. Disclaimer : This Post is only for informative purpose. Site is not responsible for any kind misuse of this knowledge. Please Don’t use the knowledge you get from this post to do any type of attacks. Thanks ! Now I unterstand how this program works, kinda amazing how it is powerful ! Is there any different program that i can use to stop netcut? Hmm now I wonder how the 'Protect my computer' check box works in this program works. DoCoMo and Fujistu Split Phone.